Unity Village is about a 20 minute drive south of KCMO. If you plan on staying close, or even on-campus, here are the details! 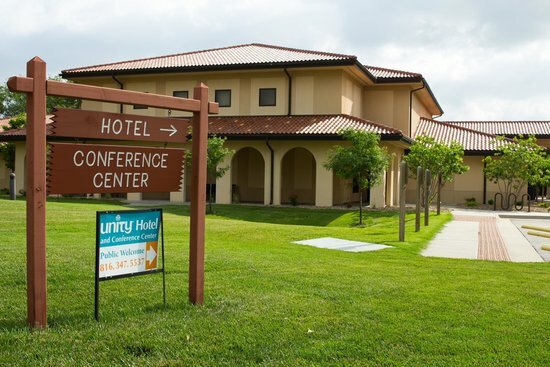 Stay in the heart of the action at Unity Village Hotel and Conference center and also enjoy free breakfast, wifi, and a fitness center! Call (816) 347-5537 to book and mention you are attending Heartland Yoga Fest or click the link below. The Heartland Yoga Fest block of rooms expires June 1st, but you are still welcome to stay here if there are available rooms. Stay close to Unity Village at Holiday Inn Express & Suites! Enjoy complimentary breakfast, wifi, and a fitness center + pool! Call (816) 600-2405 to book and mention you are attending Heartland Yoga Fest to receive a price match of $119/night or click the link below to book with regular pricing. Stay close to Unity Village at Hampton Inn! Enjoy complimentary breakfast, wifi, and a fitness center + pool! Call (816) 347-8600 to book and mention you are attending Heartland Yoga Fest to receive a price match of $119/night or click the link below to book with regular pricing. We are so grateful for our HYF Founders! We thank the following people and businesses for believing in our mission right from the start.. THANK YOU! Angela is a Kansas City native and the founder/owner of Hagoyah Hair Studio and Yoga Den in Waldo. In her studio, she brings traditional salon services together with inner beauty work through the yoga practice.